​​On your page, drag an image placeholder, double click on it, and drag a .jpg version of your final poster. Below, drag .jpg files of each version of your poster. 1. I think the main message of my poster is that many people bully other people just to feel better about themselves. So enstead of being mean be nice and other people will be nice to you. 2. Well i think that the color purple is the color that represent strenght so I think that I could use that color for my background for the people that are being bullied for them to be strong of what there dealing whit. And the pictures that I choose I thought that these pictures can help people that are bulling people can finally take a hint and know that there hurting other people for no reason and finally be kind to other people so that the people can be kind to them too. The layout I did it like that because I think that every picture that I choose maybe a bully understand that what there doing is wrong, and the pictures I made them that size so that people could actually see the pictures and also so that they could be big because big reminds me of strength so that the people that are being bullied could stay big and strong like the picture. I feel like my picture is about people being bullied and me saying ensued of being mean be ind and every body else would be kind to you too. 3. 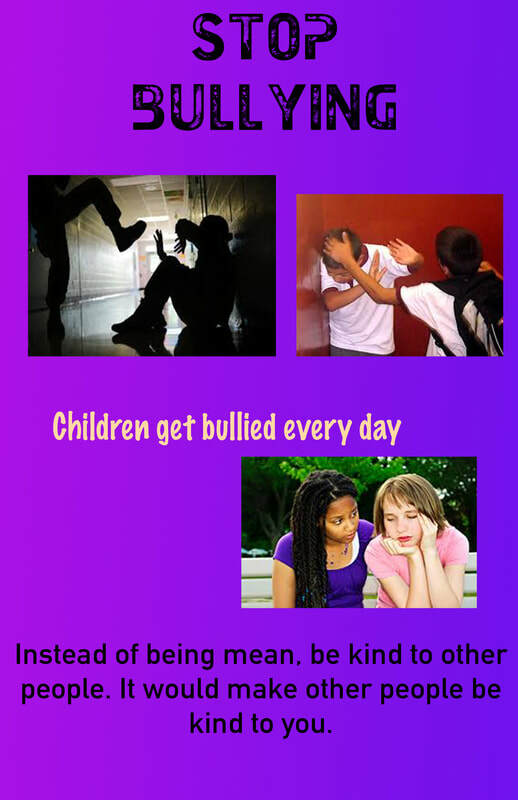 Some things I changed about the poster was the pictures because Michelle gave me an idea about me saying in the poster people bullying other people and saying ensued of being mean be kind and other people will be kind to you and maybe put pictures for each sentience. Another thing that I changed about my poster was the color from my background because I choose blue and I didn't think that represent the color of strength so instead I choose purple. 4. I feel the most successful parts of my poster was the sentience I wrote about people bullying other people and the other sentience were I say instead of being mean be nice and every one will be kin too you. Another thing I thought that was successful about my poster was the pictures because I think it really represented of what I was talking about. What I did in this video is that when my box finished laser cutting I decided to put rubber bands around the box so that it would hold the box together. The next day I glued my box then when I finished glueing my box I took of the rubber bands so that it would'nt stick to the box.